This summer I was fortunate to have two chapters that I wrote published in an excellent volume from InterVarsity Press entitled Reading the Christian Spiritual Classics (edited by Kyle Strobel and Jamin Goggin). My first contribution was a historical and contemporary overview of the discipline of spiritual theology while the other was an overview of how to read spiritual texts from the Middle Ages along with what spiritual authors I think should be read from the medieval era. I would certainly encourage you to purchase and read the whole book, but here’s my list of medieval authors that I recommend to be read by everyone. Anselm of Canterbury (1033-1109) was a Benedictine monk and Archbishop of Canterbury from 1093 until his death. While a monk at the Benedictine monastery of Bec in France, Anselm was influenced by the Rule of Benedict and Augustine of Hippo. His most well-known theological works are the Why the God-Man and Proslogion (or Faith Seeking Understanding) though he was the author of many theological and philosophical works. His greatest spiritual work, however, is a series of prayers and meditations that is simply called the Prayers and Meditations. The prayers were meant to be prayed in private and were expected to lead the one praying into deep prayer and contemplation of God. Anselm’s prayers follow a four-fold prayer pattern: 1) the prayers are read in solitude in one’s “inner room of the heart”; 2) by reading these prayers the monk’s mind is excited, bringing forth in him the image of God that is overlaid with sin; 3) one is then moved “to the love or fear of God, or to self-examination”; and 4) the reader begins to sorrow for his sins, shedding tears of despair or terror at the horror of sin and the judgment it deserves, culminating in tears of love, longing and delight in God. Bernard of Clairvaux (1090-1153) was a Cistercian monk and abbot of the monastery at Clairvaux. In spite of his extensive travels around Europe he still found the time to write nearly a dozen major treatises, countless sermons (the most important being on the Song of Songs), letters, a saint’s life and a defense of new forms of monasticism. Bernard is the quintessential monastic theologian and had gained such respect and prominence in the years after his death that Dante Alighieri has him guide Dante the pilgrim into God’s presence in the Divine Comedy. 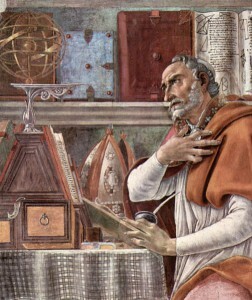 Bernard was heavily influenced by the Rule of Benedict, Augustine of Hippo, Gregory the Great and the Bible. About twenty years before his death Bernard began a series of sermons on the Song of Songs. Consisting of eighty-six sermons these sermons contain Bernard’s most developed ideas on the spiritual life: to direct humankind’s love to God and to restore with the help of God’s grace a twisted power that clings unduly to creatures, in order that once freed it may find again the dignity of its origin. Bonaventure (1217-1274) was a Franciscan friar, university professor, minister general of the Franciscan order and cardinal whose theological and spiritual treatises exercised a profound influence on medieval thought in the high and late Middle Ages. A contemporary of the famous Dominican theologian Thomas Aquinas, Bonaventure wrote a number of theological tracts and also a substantial body of spiritual texts. Two of his most important spiritual works are The Soul’s Journey into God and The Life of St. Francis. In the former Bonaventure offers six stages that the soul should pass through on its way to union with God: 1) contemplating God in his vestiges in the universe; 2) contemplating God in the sense world; 3) contemplating God through his image stamped on humankind’s natural powers; 4) contemplating God in his graced, reformed image in us; 5) contemplating the divine unity through its being; and 6) contemplating the Trinity in its name, which is Good. Having progressed through these stages the mind is then able to enter into “ecstasy” when one’s affection passes over into God. The Life of St. Francis is a biography whose structure is based on the tripartite spiritual schema of purgation, illumination and perfection. The purgative stage cultivates mortification, humility and poverty; the illuminative stage cultivates piety, charity and prayer; and the stage of perfection cultivates an understanding of the Scriptures and the gift of prophecy. Both of these texts develop a program for spiritual growth and formation in the Christian life. Julian of Norwich (1342-c. 1423) is one of the most well-known medieval spiritual writers and was an anchoress who lived in solitude in Norwich, England. While living as an anchoress she received a series of revelations or “showings” on May 13, 1373 when she was thirty years old. From these revelations it is clear that Julian was influenced by the Bible, Augustine of Hippo and the writings of other English authors such as William of St. Thierry. Though Julian’s text is based on a series of visions (which might be off-putting to the modern mind) it is extremely Christological in its focus and orientation. Julian’s spirituality is a theologia crucis with much to teach. Dante Alighieri (c. 1265-1321) is the author of the hugely influential Divine Comedy. He was greatly influenced by the writings of Thomas Aquinas and Bonaventure as well as by the spirituality of Pseudo-Dionysius and Augustine of Hippo. Divided into three books (Inferno, Purgatory and Paradise), the Divine Comedy recounts the journey of Dante from hell to heaven, while laying out a theology of spiritual ascent that highlights the role of the church and God’s grace. Hildegard of Bingen (1098-1179) was a Benedictine abbess in Germany, visionary and leading intellectual light of the Middle Ages. She is the author of theological and spiritual texts as well as musical compositions and medical texts. Hildegard’s treatises show that she was influenced by contemporary nuptial imagery like that found in Bernard of Clairvaux. She also had a strong mystical bent. Her most important theological and spiritual text is the, Scivias. Walter Hilton (c. 1343-1396) was an English Augustinian canon who studied law at Cambridge and wrote the Scale of Perfection. Book 1 envisages the contemplative life as the domain of those vowed to the contemplative religious state whereas Book 2 sees contemplation as something to which every Christian should aspire. Whether monk or lay person, Hilton believes one must strive for union with God. Thomas à Kempis (1380-1471) was associated with the Brethren of the Common Life but in time became an Augustinian canon. The author of many books, Thomas is known primarily for his The Imitation of Christ. Influenced greatly by the Bible, the Imitation consists of four books concerning both the inner and outer spiritual lives. This book is one of the greatest of all spiritual classics, influencing many later spiritual leaders, focusing on the need for not only a robust theology but also an affective disposition of the mind and soul. I am the first to confess that not all of these texts are easy to read nor will all of them be immediately palatable to readers of the Scriptorium. My full chapter in Reading the Christian Spiritual Classics addresses these concerns so, again, I would encourage you to read that as well. For me, however, these authors from the Middle Ages are essential reading for everyone serious about books, ideas and the spiritual life. Happy reading! Greg is a native Virginian who loves to travel and read. He serves as an ordained Anglican pastor and spends time with his wife Christina and sons Brendan and Nathanael. Read more about Greg here. Do I need a Job or Vocation?